This Biblical book, one of the twelve so-called "Minor Prophets," opens with the announcement of God's intention to punish evildoers (i. 2). Damascus (i. 3-5), Gaza (i. 6-9), Tyre (i. 9, 10), Edom (i. 11, 12), Ammon (i. 13-15), Moab (ii. 1-3), and Judah are taken up in turn until Israel (ii. 6) is reached. The prophet is vehement because the crimes of the people have been committed in the face of the fact that God redeemed His people from Egypt (ii. 10), destroyed the Amorites (ii. 9), and sent prophets (ii. 11) whom, however, Israel would not allow to prophesy (ii. 12). In the third and fourth chapters the prophet addresses himself directly to the kingdom of Israel. The nations are summoned to the mountains of Samaria to witness the wrongs there practised (iii. 9). The punishment that is impending will be so severe that only few will escape (iii. 12). Because of the women of Samaria, who were cruel to the poor and the needy (iv. 1), prosperity will cease (iv. 2), and not even sacrifice will avail (iv. 4, 5). God had tried to teach Israel by affliction; but neither famine, drought, blasting of the crops, attacks of insects, pestilence, defeat in war (iv. 6-10), nor even treatment like that of Sodom could induce Israel to repent. Complete destruction, therefore, is foretold (v. 1-3). In vain does the prophet admonish Israel to seek the Lord, not Beth-el (v. 4-6). Samaria persists in being wicked and unjust (v. 7, 8). Once more the prophet calls upon Israel to repent (v. 14); and, as before, Israel fails to do so. Besides injustice and irreligion, Israel indulges in luxurious and riotous living (vi. 1-6). This, too, is a factor which inevitably leads to captivity (vi. 7). With chap. vii. begins a series of visions, which continues to chap. ix. 6. A plague of grasshoppers (vii. 1-3) and a fire (vii. 4-6) are followed by a third plague; and the plumb-line is set up against the city and against the family of Jeroboam (vii. 7-9). The prophet's audacity brings upon him the hostility of the reigning house; and he is ordered to confine his prophetical activity to the land of his birth, Judah. Amos disclaims being a prophet, or the son of a prophet, and reiterates the certainty of coming misfortune (vii. 10-17). The last vision, representing God Himself standing at the altar and announcing the terrible catastrophe (ix. 1-6), emphasizes the hopelessness of escape from divine vengeance. The book ends (ix. 7-15) in words of comfort. The remnant shall return and in the future the land will yield abundantly (13-15). 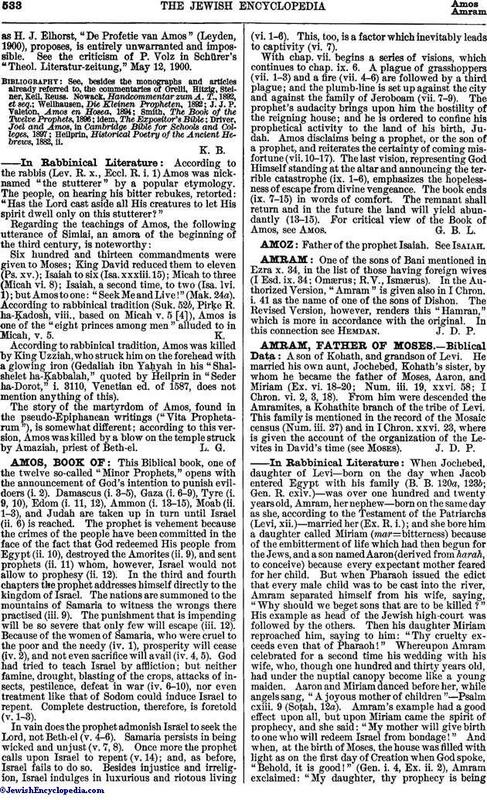 For critical view of the Book of Amos, see Amos.